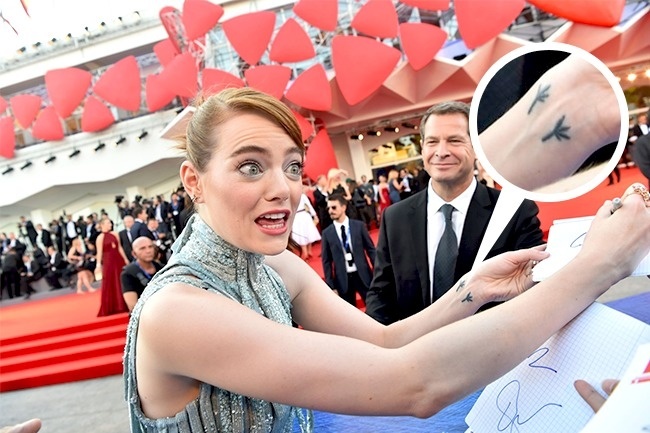 Lots of celebs have several tattoos on their bodies. But the status of a celebrity doesn’t guarantee that they will not get any typos, ‘side’ effects or other regrets related to tattoos. GirlTrendy.com found 10 famous tattoo stories which are enjoyable to read. Open each page and enjoy new stories! What are those chicken footprints doing on the beautiful Emma’s wrist? First of all, these are not chicken paws, but blackbird’s footprints. That’s related to the one from the song of The Beatles ‘Blackbird’. The actress likes to say that the mockup of the tattoo was made by Paul McCartney himself. The same exact tattoo is on her mother’s wrist. She recovered from cancer and to celebrate this they decided to have a family tattoo salon visit.